The standard “97.5/1.57” coupling highlighted in yellow carries a torque of 11,000 Nm and has a torsional stiffness of 177,000 Nm/rad. The new series arrangement would also carry a torque of 11,000 Nm, however the torsional stiffness is reduced to 88.500 Nm/rad. The axial, radial and angular stiffness are also reduced by half. The transfer plate adds an extra inertia element to torsional vibration models (typically mid-value of the coupling halves), while the cover is longer than the standard. 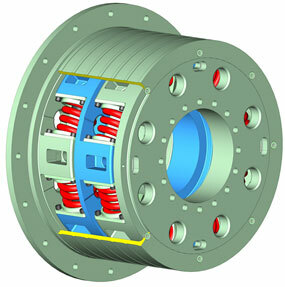 The axial width is slightly more than double the standard single row coupling width.